Danubio Azul liveaboard with a small capacity offers to discover underwater treasures of Galapagos Islands. You can rely on the personal care on the board of Danubio Azul. Danubio Azul can accommodate 10 persons on the board. 5 Cabins with double beds are located on the upper deck, 1 double bed stateroom is on the main deck and 3 cabins equipped with twin bunk beds are on the lower deck. All room has private showers and air conditioning. A cozy open air dining area is perfect to relax and spend time chatting with boat’s passengers. The boat also has a sun deck with the panoramic view where you can stay to watch the stunning views. Danubio Azul’ s dive deck big enough for comfortable preparation for the dive. It’s shaded and supplied with storage boxes. Safety on the board of Danubio Azul meets all the international safety standards. Boat equipped with first aid kits, emergency rafts, and life vests, there is a fire alarm fire extinguishers. Boat’s crew trained to manage emergency situations. Danubio Azul’ s itineraries include diving at Santa Cruz Island, Bartholomew Island, Cousins Rock, Wolf Island, Darwin Island, Isabela Island. These destinations are a true diver’s paradise. A few ocean currents cross near Galapagos Islands, that provides an overwhelming array of marine creatures. It’s a home for sea lions, penguins, seals, eagle rays, marine iguanas, hammerhead sharks, Galapagos sharks, sea turtles, golden rays and whale sharks. There are two major seasons in Galapagos Islands. The Rainy season lasts from December to June and brings high humidity and temperatures between 26-30°C/79-86°F. Temperature is slightly cooler from June to November and ranges between 20-24°C/68-75°F. Although diving is possible throughout the year. We spent a week of diving in January on Danubio Azul liveaboard. Experience both above and underwater was amazing. 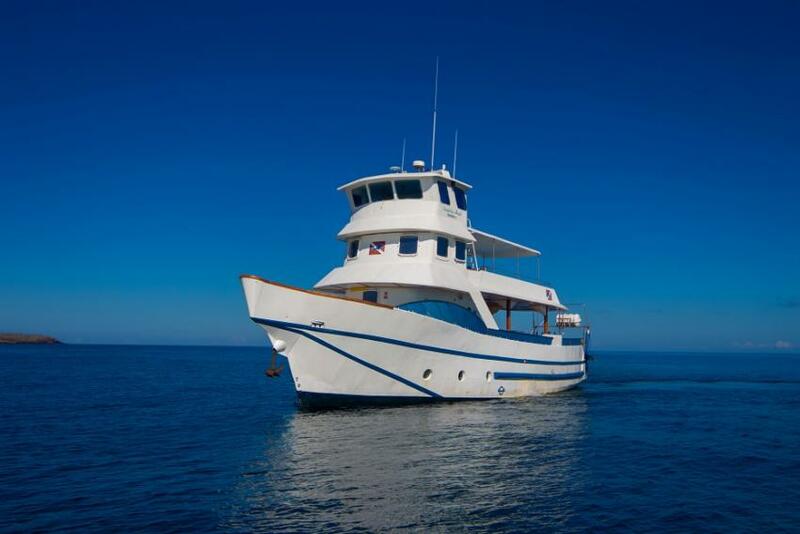 The boat is clean, the cabins are comfortable and there is everything you would need for a week in the ocean. The team is professional, energetic, helpful and always making sure you have everything you need. Make sure you ask for the dive guide David Iglesias, always eager to show you more and going one step further so you can see the best of Galapagos, both on land and underwater. Thank you Danubio Azul team for making a dream come true the best way possible. Hope to see you again! Without a doubt, this is the best liveaboard you can take, when in the Galapagos. We dived with them for 8 days in January and were absolutely blown away by the professionalism and exclusive diving they provide. Captain Wilson and his team are excellent hosts, the boat has everything that you need - expect no luxury, but be sure you will have a clean, comfortable cabin. The true luxury comes when diving - it is privilege to dive in a small group, as only Danubio Azul can provide and ask for David Iglesias to be you guide. Danubio Azul is the only boat to dive 2 whole days on Darwin and you cannot find anything better than that! Special thanks to the entire crew, David and captain Wilson, it has been a pleasure and experience of a lifetime. The diving was absolutely stellar, which is what it really comes down to and we had a fantastic time. The crew of Danubio Azul was great - very helpful and accommodating. The food was surprisingly great. The boat and cabins are not geared towards luxury, but are functional and had the essentials. The upper deck is a very nice area to relax in between dives and enjoy the scenery. We had cabin number one which was up on the top level and would highly recommend it.